It used to be difficult, if not impossible, to find good old-fashioned American style cupcakes in Paris. Not anymore. Now there are cupcake stores, cookie stores and hamburgers springing up all over. But the best cupcake store in Paris is still Sugar Daze, in Pigalle, just up the street from our house. The best (and the most beautiful) cupcakes in town. 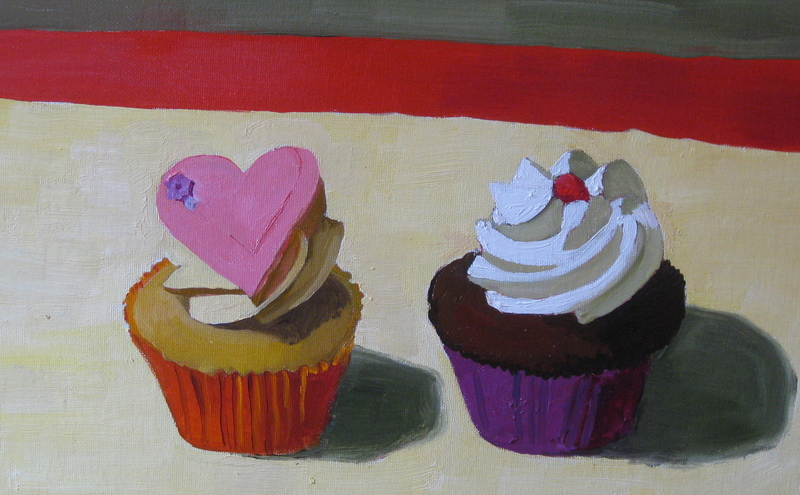 I bought these cupcakes for Valentine’s Day last week, and made this painting, inspired by Wayne Thiebaud. Wayne Thiebaud is an American painter, known for his painting of cakes and pastries. Earlier this month: My painting “SAMUEL”, was set to music by the Australian composer Helen Davey. Click Here, to listen. One Year Ago: I introduced a new series, “Sign Paintings”. Click Here, to read about it. They are great, but I always share!